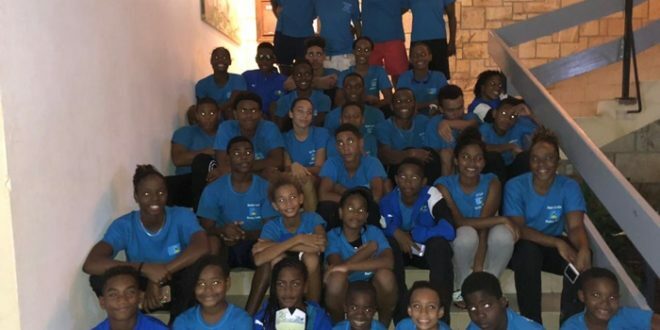 Press release- SLASA — St. Lucia OECS Swim Team departed St. Lucia November 7th for what was considered to be a meet swimmers had to dig extremely deep to bring in the trophy. 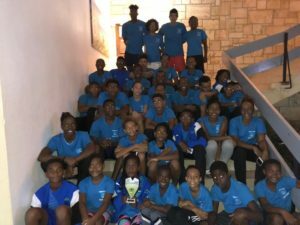 Noting the absenteeism of a few of St. Lucias strongest swimmers from the competition, the selected 34 swimmers walked away with 70 individual and 9 relay medals (30 Gold, 23 Silver, 26 Bronze). 20 age groups records were broken by 7 swimmers to include Fayth Jeffrey in the 8 and under 100 Meter IM, Tristan Dorville 9 – 10 50 and 400 Meter Free and 50 Meter Back, Antoine Destang in the 9 – 10 100 and 200 Meter Freestyle, 50 meter Butterfly and 100 Meter IM, Karic Charles 9 – 10 50 Meter Breast, D’ Andre Blanchard 11 – 12 50 and 100 Meter Free, 50 Meter Breast, 50 and 100 Meter Butterfly, Jayhan Odlum Smith in 15 -17 50 Meter Back, 50 and 100 Meter Butterfly and Runako Daniel 18 and over 50 Meter Butterfly. 3 National Records were slashed by Jayhan Odlum Smith in 400 Meter Freestyle and 100 Butterfly, Runako Daniel 50 Meter Fly. 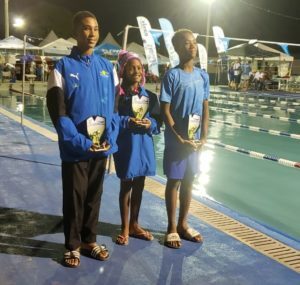 Winning overall individual high point placement in the 8 and Under Age group was Fayth Jeffery with 59 points, 9 – 10 Antoine Destang contributing 58.50 and 11 – 12 D’Andre Blanchard the biggest point earner from team St. Lucia with 91 points. At the end of the pool swimming competition, Grenada emerged winners with combined scores of 1485, Antigua placed 2nd with 1325, St. Lucia 3rd with 1167 and St. Vincent 4th with 955 . SLASA President Eddie Hazell notes though the team may be disappointed, he is extremely proud for the efforts of the coaches, team management and most importantly the swimmers who continue put in all the effort to dig deep. The Federation will now go back to the drawing board and work on its plan for upcoming meets.